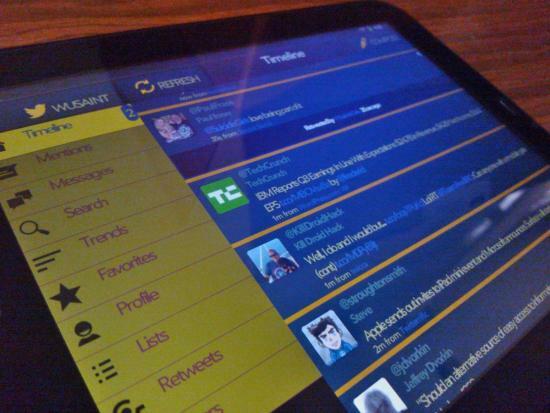 Last month developer Bryan Leasot was kind enough to give us a very early preview of his up and coming Twitter app Neo. At the time the app was in an extremely early beta stage and was a little rough around the edges but showed a great deal of promise. Despite the app’s then rough edges, we really liked the extreme customization options found in Neo. To our knowledge, there is simply no Twitter client that allows such a deep level of customization. In the end we walked away impressed and looking forward to an official release of Neo. So here we are a month later putting the official version of Neo through its paces. Are we still as impressed as we were last month? Once you are signed in to Twitter, you immediately notice just how different the appearance of Neo is when compared to other Twitter apps on the TouchPad. Instead of the expected rounded boxes, gray menus, and webOS icons, you're greeted by a more angular look that is far from typical for a webOS app. While a squared-off interface is all fine and dandy, what makes Neo really stand out is this interface is customizable (although we must say we really dig the stock theme). Customizing Neo can be a rather time-consuming affair if you're as picky as we can be, but considering the number of things you can customize that's to be expected. Thankfully this is all accomplished via sliding bars to adjust the various colors, sizes, and other settings. The end result can be an app that is highly personalized. You can save your custom themes for later use and can even email your custom themes to share with your like-aesthetic friends (or whip up something awful and send them that instead). 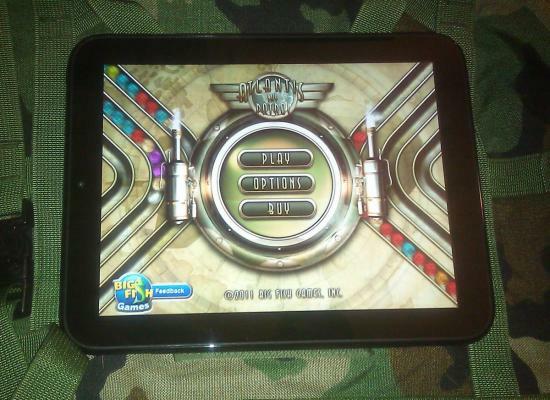 As the long hot days of summer wind down, you're swiping through the panes of your TouchPad searching for a game that would provide a challenge and is yet easy on the pocketbook. We don't blame you for tiring of fluffy birds languishing for an update or discs and marbles and random things that don't really make that much sense. Sometimes you just need a game with a simple premise and even simpler execution. You don't need fancy graphics and you don't need absurd mechanics - you need Sorted, with its colorful balls and court and weirdly moveable walls. No matter what phone or tablet you are using, one of the most important things that you need is power. Without power, there is no way to turn on the device, turning your expensive piece of electronics into a fancy paperweight. At home or work, you just plug in your phone or TouchPad or rest them on a touchstone to keep them charged, but what happens when you are out and nowhere near a wall or car charger? If you have any of the Pre or Pixi line of phones, you can pick up a spare battery to take with you (the Veer and TouchPad do not have removable batteries), but you also have a rather large selection of portable battery backup solutions that you can choose from to keep you charged on the go. These portable batteries come in many shapes and sizes and have different ways to charge or power your devices. They can be small enough to fit in the palm on your hand, or as large as a backpack. Some can only charge one device while others can charge multiple devices simultaneously. Many have built-in plugs for wall outlets while others need to charge via a micro- or mini-USB cable, just like your phone. Some may have a built-in micro-USB port to charge your devices while others simply have a USB-out port that requires a separate cable to connect to your device. Finally, some will only work on phones while others will also charge your TouchPad. To help you figure out which backup battery solution is best for you, we put 7 options through their paces, although this is hardly a definitive list of battery packs as there are plenty of other options out there, too. 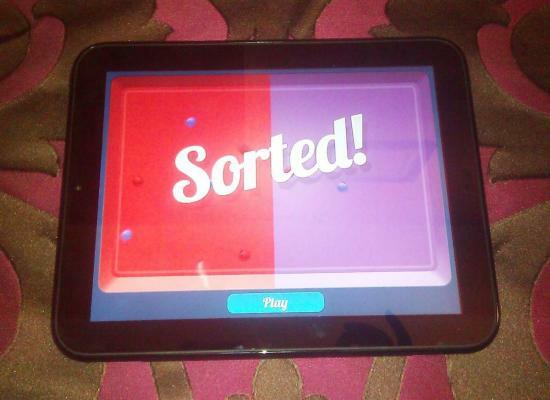 There are few quality webOS app developers that are as prolific as Inglorious apps. From a solid foundation on webOS smartphones to apps like Pix and Notes HD on the TouchPad to the very well-received Inception-like multitasking within itself app Glimpse, Inglorious Apps has rarely dissapointed (except for that whole putting Dock on Android and iOS before webOS thing). 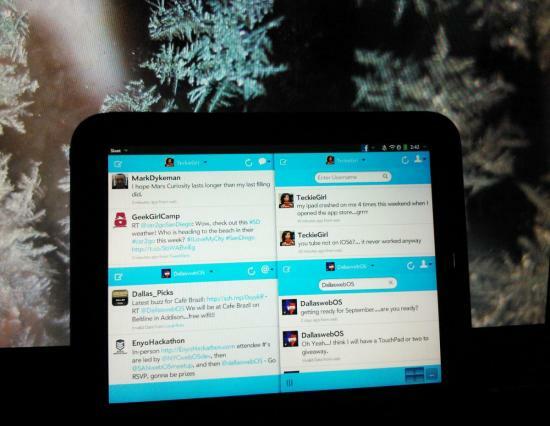 We'll admit to being fans of Glimpse's Twitter widget, and sometimes put multiple of that widget on a single screen. If that's something you want, but don't feel like spending a whole $5.00 for other widgets you're not going to touch, then Inglorious Apps' latest creation might be for you: Sleet. Everyone remembers playing with marbles at a young. We reminisce, looking with wide eyes at the bright jeweled orbs that take us back to a simpler time. We pretended they were tiny planets in the palm of our hands. Time shifts, rapidly going forward and it’s twenty or thirty years later and our kids have a new game. It still has those jeweled tiny balls of fun, but in a digital fashion, with the traditional game of marbles having been juiced up for big screens. 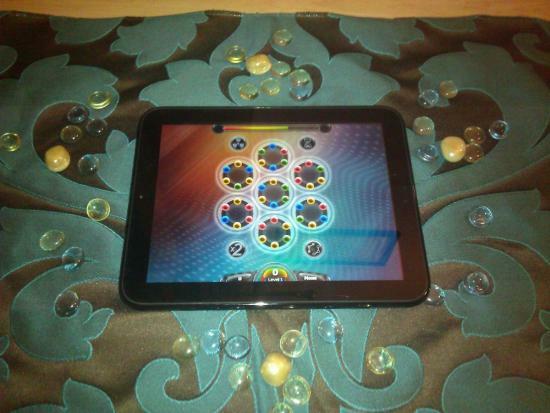 When Spinballs entered the App Catalog, we could help but be intruigued. Do you have that Karate Kid inside you? Are you ready to train to defeat your foe and master the shuriken? You must maintain balance and harmony, but be quick as the rabbit, and quiet as the wind. 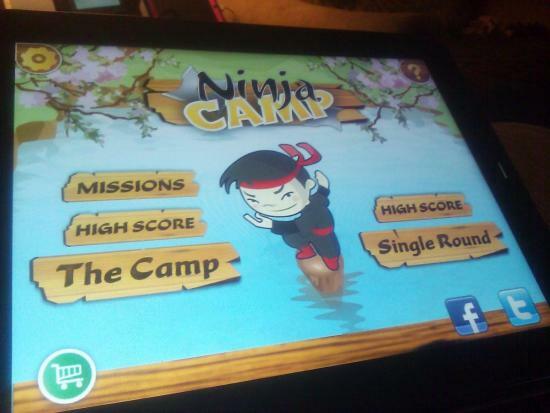 In Ninja Camp you can become a ninja star able to slice wood in a single throw. Fifty or sixty years ago, when we didn’t have tablets or social media dictating the speed and accuracy of the news and what was important to you, you got dressed and headed to the store to pick up a newspaper (or if you were smart, you had one delivered to you ever morning). For those under the age of forty, it’s that big stack of folded paper that your mom bought to clip coupons. it was loaded with pertinent information about world news, weather, and just sport score you could imagine, plus those you couldn't when the paper needed a few more column-inches filled out. The best thing about technology these days not only does it inform us in the blink of an eye, it actually helps people with disabilites of all sorts. We've all heard how tablets and smartphones are helping those with cognitive and communications disabilites, but for being very much vision-based, smartphone and tablet technology is making a surprising jump into the vision-impaired space too. What's proven to be the most useful for the vision-impaired is also useful to the average citizen: text-to-speech. 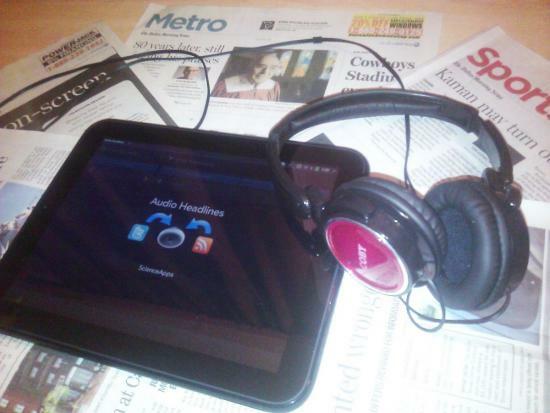 With Audio Headlines on the TouchPad we get the very latest latest news headlines delivered as spoken word. Sure, text-to-speech isn't a new technology, but we're still pleased any time we see a good application of it. You rmission, should you choose to accept it to save the world be defusing doomsday devices discovered in cities around the globe. You're the best pilot in the Air Force, you know it, the General knows it, and the President knows it. You are the leader of the elite Atlantis Sky Patrol, and your course of action is to match moving balls and solve puzzles. Editor's Note: Yes, this is for Android, no it won't work on your webOS device. But there are still some Palm OS users out there - this is for them. Those of us who have been PDA and smartphone users for enough years likely spent at least some time in the PalmOS world. For me, that lasted from 1996 and my first Pilot 1000 through the TX I used until getting my Palm Pre in 2009, an almost 13-year run. 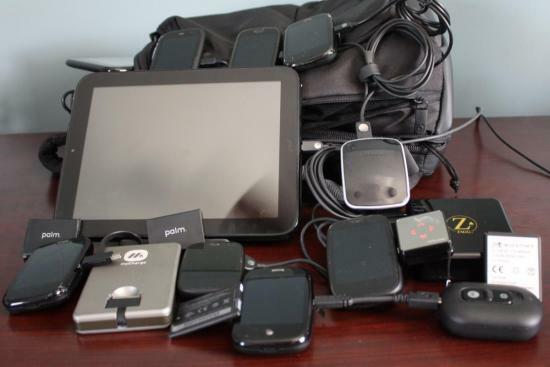 Over that time, I accumulated a large number of applications, and PalmOS-formatted files, that have been all but unusable since I left the platform behind, especially after MotionApps dropped support for the PalmOS emulator Classic that shipped with the initial webOS devices. While most features and programs from PalmOS are available in more modern operating systems, a few are either no longer supported, or just not as well-designed as they were for PalmOS, and there are also some legacy applications (particularly custom business apps) that are still in use and needed in the real world. In response, StyleTap has long offered its eponymous PalmOS emulator platform, which allows installation and running of PalmOS applications on mobile devices including Windows Mobile, Symbian OS, iOS and now Android 2.0 or later with StyleTap Platform for Android. Unfortunately, the application (including both desktop and device components) costs a whopping $49.95, the same price StyleTap charges for its other platforms, putting it out of range of most casual or nostalgic users. With my irony meter at 11, I downloaded and installed the demo to my brand-new Verizon Samsung Galaxy S III, to which I had already installed Access’ Graffiti (another PalmOS legacy that remains among the fastest and best handwriting recognition and text entry methods around). Note that, while StyleTap offers a downloadable installer for Windows which sets up the app installation program and detects an Android device connected in either USB media device (MTP) or camera (PTP) mode, it is unable (at least as yet) to install the emulator itself to the device. To do that, I had to manually download the .apk, move it to my GSIII via USB connection, and install it myself. As a reviewer of many games for the TouchPad, let me preface to say I have never encountered a game such as this on any level. 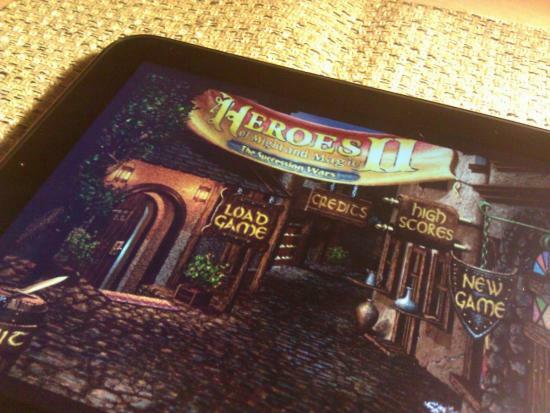 It reminds of a line Big Bang Theory's Sheldon says to Penny: “Doodle Jump is a game, Angry Birds is a game, but the Age of Conan is a lifestyle.” So, in the pursuit of that lifestyle we happened upon Free Heroes 2, a classicly-styled medieval quest game based on the open source engine of Heroes of Might and Magic II. If you're looking for some turn-of-the-century gaming nostalgia, you won't have to look much further than this.